You can debate just about anything concerning cars and trucks, but one thing is impossible to argue: Ford F-150 is the undisputed heavyweight champion of American roads. No vehicle has been more essential or sold more models since this pickup’s debut in 1975. As of 2017, the F-150 and its heavy-duty counterparts topped the sales charts for 35 straight years. That’s quite a run, and these trucks beat the competition in their segment for even longer (40 consecutive years). But the F-Series pickups didn’t come out of nowhere during the 1970s. Ford launched its iconic pickup way back in 1948, just after World War II. Prior to the F-1 debut that year, the automaker’s trucks were simply modified cars. The 1948 model changed that, and the F-Series continued its evolution into the 21st century. These days, the F-150 and heavy-duty models sport the most advanced tech and interior comfort that pickup trucks have ever seen. It certainly didn’t start that way. Here are 25 snapshots of Ford’s F-Series pickups — from the earliest days of its predecessors to the latest off-road conqueror. To find the origins of Ford trucks, we have to go all the way back to the 1910s, when the automaker converted the Model T into a pickup. As the picture shows, this vehicle was little more than a roadster with a flatbed fitted over the back wheels. However, even such a basic setup got products moving in the early days of consumer transportation. While there was obvious appeal for a Model T truck, Ford improved upon the concept with the Model A and Model B. The bed was longer and the weight distribution better, so there was plenty of appeal for truck buyers during the Depression, especially with the arrival of the truck’s V8 engine. Yet it was still a roadster and had its share of limitations. The hardtop, long-bed truck concept took form by the late 1930s, and by the time 1941 models appeared, there were several options for consumers. Among the choices were new V6 engines to go along with the V8 and four-cylinder options. Ford borrowed both the grille styling and the underlying platform from cars here, and launched additional truck plants by 1941 in case the United States entered the war. Consumer production ended for several years after the Pearl Harbor invasion. Following World War II, Ford launched its first all-new truck platform with eight different models. From the half-ton F-1 to the three-ton F-8, consumers had plenty of choices. Engine options ranged from a 95-horsepower V6 to a 100-horsepower V8. F-Series trucks began with a humble, utilitarian look and greater practicality than its predecessors. In 1953, Ford celebrated its 50th anniversary with the introduction of second generation F-Series models. The front grille changed considerably (new engines also arrived), but this redesign was more extensive. An improved V8 engine, longer dimensions, better visibility, and automatic transmission were introduced. So were hood ornaments and the nomenclature we recognize today: F-100 and F-250 replaced the three lightest pickups in the lineup. Updates for F-Series trucks continued throughout the second generation. While the wraparound windshield offered improved visibility for drivers, upgraded power specs expanded their options on the work site. Six cylinder engines maxed out at 115 horses by 1954, while the V8 engine pushed the envelope to 130 horsepower. Even more power came by the 1956 model year, with the F-Series V8 engine delivering up to 173 horses, according to Edmunds. You can’t help staring change in the face when comparing the second and third generations of F-Series trucks. A square grille and double the number of headlights greeted Ford truck consumers beginning in 1960. Three years earlier, the 1957 models debuted the pickup’s wider cab and other updates. Starting in 1959, Ford began offering four-wheel drive in factory models. With four-wheel drive capability and over 200 horsepower arriving by 1965, fourth generation Ford trucks continued the march to the modern era. Super Duty trucks had made their debut in 1958, and this shot from 1963 is a look at the model year’s Ford F-250. Two headlights returned for those who operated by night. Starting with the F-Series’s fifth generation, truck consumers could choose from three trims: base, custom, and Ranger. Going with the Ranger meant carpeted floors, a standard chrome grille, and more comfortable seats. By 1970, before fifth generation models ended their run, a fourth trim (XLT) entered the picture. Regulations mandated side reflectors beginning in 1968, and this heavy-duty model from 1971 shows how Ford rolled that into a badging opportunity. An updated V8 engine now delivered up to 220 horsepower. Meanwhile, the relentless restyling of the grille continued apace. Sixth-generation (1973 to 1979) F-Series trucks were remarkable for a number of reasons, but we’ll begin with the arrival of SuperCab for 1974. Dodge had pioneered the pickup with extra seating, and Ford felt obliged to respond. Yet another V8 engine entered the picture as well. But America’s favorite truck was about to be born. Why was the F-150 necessary? By the mid-1970s, consumers found themselves caught between the not-quite-capable-enough F-100 and the mighty F-250. This model bridged the gap starting in 1975, and about one third of F-Series sales were made up of F-150s that year. While America celebrated its bicentennial in 1976, F-Series trucks began their run atop the sales list that continues to this day. Starting in the early 1980s, Ford truck consumers could style their trucks with custom paint packages. The new focus on lifestyle prompted promotional photos like this one showcasing a family enjoying a day by the lake. These trucks delivered at work and were comfortable enough to enjoy after hours, Ford suggested via its marketing. Note the blue-oval emblem making its first appearance on the grille. F-100 production ended in 1983. Beginning with the 1987 model year, Ford F-Series trucks had entered their eighth generation. Wraparound parking lights and standard fuel injection were two key upgrades. F-350 and heavier models became part of a new Super Duty line. The newly simplified grille enjoyed a long run through the following generations. In the final years of the F-Series’s eighth generation, truck lovers got new performance and styling packages. Among them, the heavy-duty service package made the job for snow plows easier. For 1991, the “Nite” package delivered a blacked-out F-150 for consumers looking to stand out from the legions of Ford truck owners. 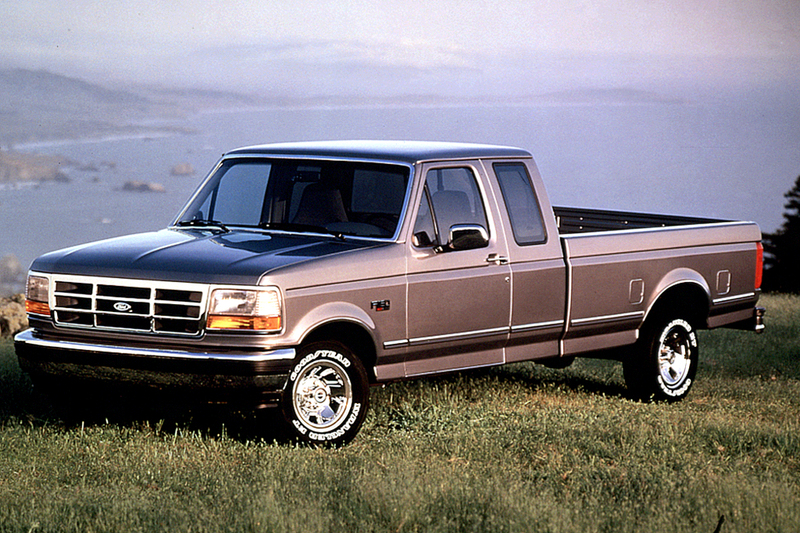 As of 1992, when the ninth generation F-Series made its debut, Ford had enjoyed well over a decade at the top of America’s sales charts. Naturally, the automaker saw a chance to experiment and released a performance model through the Special Vehicle Team in its inaugural year. Using its exceptional handling, this 1993 SVT F-150 Lightning could equal or beat a 1993 Ford Mustang GT in long track runs. On top of new performance models, the Ford F-Series also got major cosmetic upgrades in its ninth generation. Designers were looking to appeal to yet another young generation of consumers. A special Eddie Bauer trim entered the picture in 1995. Major changes arrived with the 10th generation of F-Series trucks that commenced in 1997. The nameplate celebrated its 50th anniversary in 1998 and (to mark its modernity) Ford dropped chrome from the grille and added more curves than these trucks had sported in decades. Heavy-duty trucks got their own F-Series Super Duty line starting in 1999. The first redesign of the new millennium brought an all-new platform for the F-150 (2004) and, finally, for the Super Duty trucks (2008). Designers had emphasized even greater comfort and styling in the flagship pickup for the 11th generation. This model cycle had a very short run, and ended at the start of the Great Recession. Wartime America seemed to exert its influence on the 12th generation of F-Series trucks. There was no questioning the intensity of the 2009 F-150 with its bold grille and aggressive stance. Midway through the model cycle (2011), Ford confronted soaring fuel costs with the first 3.5-liter EcoBoost V6 engine in the F-150. Toward the end of the 12th generation of F-Series trucks, Ford Super Duty models veered close to perfection. The 6.7-liter Power Stroke turbo diesel engine became an option in 2011. A few years later, with several decades in the books and millions of models on the road, iSeeCars.com counted more F-250 Super Duty trucks above 200,000 miles than any other vehicle. If you think of serious automaker gambles, the 13th generation F-150 is near the top of the list. After several decades atop the sales charts, Ford left behind steel for an aluminum truck body — and it worked. The new F-150 became the first pickup to receive a five-star NHTSA safety rating and an Insurance Institute for Highway Safety Top Safety Pick designation. Now that the results are in, we can say Ford nailed the redesign and only enhanced the reputation of its flagship truck. If you find yourself stuck on the road after an apocalypse, we suggest flagging down a 2017 Raptor. Ford took the concept of a performance pickup and ran with it here, equipping Raptor with 510 pound-feet of torque and substantial interior comforts. However, we’ll merely point out the very appealing visual cues. We can’t think of a cooler-looking pickup on the road. One century after Ford debuted its first Model T truck, the 2018 F-150 entered the scene. New advanced collision protection technology and the F-150’s best towing capabilities were key upgrades. Meanwhile, standard start-stop features made it more economical than any previous model. While we’re not sure about the next century of truck production, Ford closed its first 100 years on the job in style.